Employers and employees should both understand the power of offering instant access to earned wages. Some argue the concept of payroll began to develop the moment humans started reading, writing, and determining arithmetic. The combination of these three skills has long shown that humans have an instinctual need for administration and organization. The first signs of organizing a payment method may be as early as 7000 BC when archaeologists found evidence of citizens in Mesopotamia paying workers and employers in beer as depicted in stone carvings. In 5th century Athens, there is evidence that the Athenians developed a system for managing pay in which public servants, treasurers, and clerks kept records by chiseling payment details and financial records into stone. Learn where payroll started, and how modern technology has allowed us to break from the restrictions we inadvertently put on ourselves. The 1920s marked the creation of even more taxation, specifically sales taxes were enacted first in West Virginia in 1921. President Franklin Roosevelt signed the Social Security Act in 1935, and Social Security taxes were first collected in January 1937, although no benefits were paid until January 1940. The 30s also marked the time when payroll taxes began. Before to the Great Depression, there were no federally mandated insurance or retirement plans. The first set of payroll taxes were used to fund programs like social security, and unemployment insurance. Up until this point, no progress toward payroll automation had occurred. It was still standard practice to tally employee hours in ledgers and hand write checks with numbers and bank codes. In 1947, General Motors was the first to establish an “automation department” that automated payroll. In 1957, ADP became one of the first companies to begin the shift from manual to automated payment processing. Additionally, IBM’s first computer was released in 1953, setting the foundation for fundamental changes to automation. MIT designed the first personal computer, which would make computing more accessible to the masses and in 1962, computer science became an area of study in the U.S., and eventually, an official requirement for businesses looking to stay competitive and automate manual processes. In the 1960s, Medicare was introduced to rectify the issue of healthcare for the elderly. The FICA tax was increased to pay for this expense. The alternative minimum tax (AMT), a type of federal income tax, was enacted in 1978 which meant a separate set of rules to calculate taxable income after allowed deductions. Automation became even more accessible in the 1980s thanks to the arrival of desktop computers. As a result, dozens of payroll companies began to emerge. Payroll innovators made it simpler and more affordable for companies of all sizes to conduct payroll. In 1982, the American Payroll Association was founded. Additionally, the 90s marked the introduction of Social Security payroll deductions (1992), which called for an automated, electronic system to manage money behind the scenes for employers. Thanks to the influence of tax institutions, we backed up into a situation where we are paid every two weeks. It’s always made sense from a tax and technology standpoint. However, present-day technology aims to change that. In fact, we could make direct deposit every day if we wanted to. As it is today, the two week pay period is now a situation where labors are lending their organizations money with zero percent. When workers can’t bridge the gap between two paychecks, they are forced to borrow money elsewhere. Give your employees the freedom to choose when they are paid. Daily pay benefits are a solution that let your employees control when they get paid, empowering them to meet financial goals and pay bills on time. Megan Wells is a data journalist and digital copywriter based in San Francisco, California. Wells currently focuses on personal finance, mortgage, and lifestyle content. Wells' work has appeared in publications like Fox, Nasdaq, MSN, and Motley Fool. Wells also spoke at the 2015 Exceptional Women in Publishing conference. The introduction of a daily pay benefit is great news for employees. Your employer cares enough about your financial wellness to find a solution that allows you to access your money when you need it most. However, you shouldn’t just blindly sign up for a daily pay benefit. Not all instant pay solutions provide access to earned wages in the same way. You can see a chart of some of the differences here. You should also understand your rights when it comes to getting instant access to earned wages. A daily pay benefit should serve you and your financial needs, not the needs of the technology that makes instant transfers possible. As an employee you have certain rights, the same way you have workplace rights and rights with respect to your health benefits. This is the Daily Pay Benefits Bill of Rights - consent options that employees should be aware of before opting-in to an earned-wage service. A daily pay benefit should be completely optional. Employees should not be auto-enrolled. If an employee does opt-in to use the benefit, it should be clear what steps they need to take to opt-out. Employees who choose to opt-in to a daily pay benefit should be able to do so at any time. There should be no waiting period for new employees, or an open enrollment period that existing employees have to wait for. A key component of a daily pay benefit is you should be able to get funds when you need them. Unexpected expenses sometimes require immediate access to money. Therefore, a daily pay benefit should offer a truly instant option to ensure that emergency transfers are available when needed and as expected so that bills or fees can be paid. An on-demand pay service should provide options for how quickly a transfer happens: instant, same day, or next day. Transfers through an on-demand payment platform typically require a fee. If a daily pay benefit does offer control of the transfer speed, it should also offer options for how much a transfer will cost. A transfer that isn’t needed until the next day should not carry the same fee as an instant transfer. Employees have the right to choose where they receive their instant pay transfer: bank account, pay card, or debit card. Employees should know how much is currently available to them with an accrued amount via their daily pay benefit; and they should know exactly how much they will receive when the next payday arrives. There should be no surprises when a paycheck is received. Employees have the right to know what information is being collected about them, and what their employer can and can not see about instant transfers being initiated. 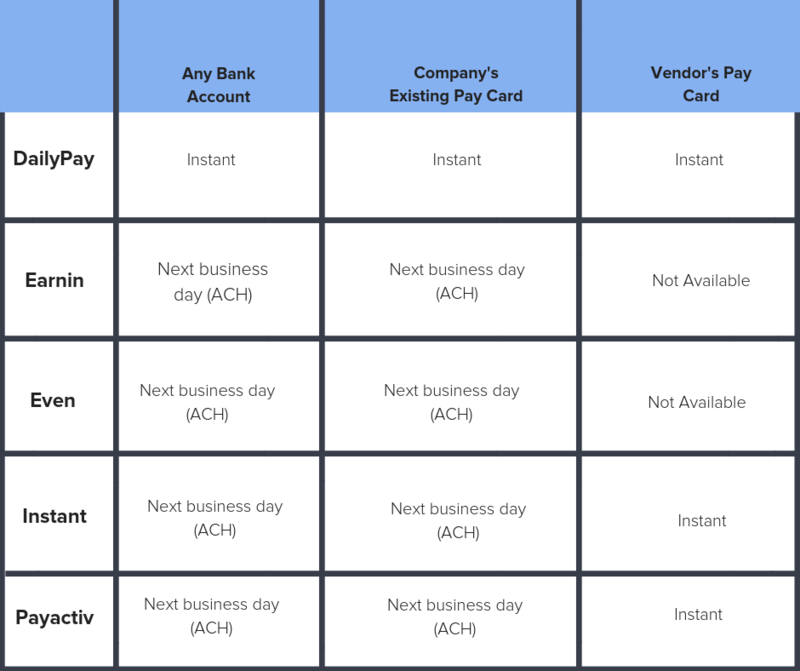 What Is The Difference Between Instant Payments And A Paycard? Instant payments and pay cards. Let’s explore the differences between the two. A paycard is a prepaid card that employers can use to pay their employees. Each payday, the card is loaded with the employee's earned wages for that pay period. Employees can use the paycard like a debit card to make in-store purchases, or they can use the paycard to withdraw wages through an ATM, bank cashier, or purchase where they receive cash back. An instant payment uses an automated clearing house to immediately initiate a transfer request and move funds from an accrued earned wage balance to a desired destination, which could be a paycard but also could be a bank account or cash card. An instant payment is more flexible and provides employees with more options for how they receive their funds transfers. Instant payments are more flexible, in that an employee can get paid through any vertical -- their designated bank account, a cash card, or a paycard. If you currently have a paycard program today, you already know the paycard adoption rate within your company. Typically, that adoption rate is between 10-40%. That means the other 60-90% of your employees receive their pay into their traditional bank account or separate prepaid cash card. Providing your employees the flexibility to choose their method to receive pay anywhere with instant payments vs a paycard will go a long way. As an employer, being transparent and upfront about any fees the employee may incur, is vital to maintaining trust in your workforce. Paycards typically have cash withdrawal ATM fees for 90% of ATMs. With both instant payments and paycard, the payroll team benefits by seeing a reduction in paper checks. This means less time and money spent which is better for your organization’s bottom line. That being said, paycard companies often directly charge the employer a fee to use the card. The other consideration is when a company already has a paycard program in place. You need to evaluate the cost of removing that existing paycard program and replacing it with a new one, or simply deploying a more universal instant payment solution that reaches all bank accounts, all paycards, and all cash cards. *Based on publicly available information. Daily-Pay-Benefits.org is not responsible for any inaccuracy of information in this chart.